After spending nearly 20 years working as an assistant coach for various college teams and NBA teams, David Fizdale has become one of the most well-loved coaches in the NBA who is well on his way to becoming one of the most reputable. The Los Angeles native earned his first head coach gig in 2016 with the Memphis Grizzlies but has since moved on to take the same position in New York. Fizdale’s accomplishments belie his humble beginning. He was mostly raised by his single mom and his grandpa, who was a sanitation worker. Find out more about his incredible grass to grace story here. David Sean Fizdale was born on the 16th of June 1974 in Los Angeles, California. He grew up in South Central L.A. and attended John C. Fremont High School. While in high school, he grew into an excellent point guard thanks to his coach/cousin Sam Sullivan. In his three seasons with his high school team (The Pathfinders), the team lost just seven times. He also helped the team to the City Section 3A title in 1991. David Fizdale finished high school in 1992 and obtained an athletic scholarship to the University of San Diego. In San Diego, he studied communications and sociology and also continued his exploits on the basketball court with The Toreros. In his senior year alone, he averaged 7 assists per game and was named to the All-West Coast Conference team. On leaving college, he went to work as a video game intern for NBA side, the Miami Heat. The internship lasted a year (1997) and in 1998, he joined his alma mater as an assistant coach. Fizdale spent four years with The Toreros during which he established a reputation for his people skills and basketball intelligence. In 2002, he joined Fresno State University as an assistant coach, spending a year there before moving to The Golden State Warriors as an assistant in 2003. He was with the Warriors for a year before joining the Atlanta Hawks as an assistant coach. In his four year term with the Hawks (2004 – 2008), he not only helped the team increase their winning streak but also helped them reach the playoffs for the first time in nearly a decade. In 2008, David Fizdale moved to Miami Heat. He spent eight years with them during which he won two NBA titles (2012 and 2013) as an assistant coach. After nearly two decades of working as an assistant, Fizdale was appointed the head coach of the Memphis Grizzlies in 2016. He spent just one season with the team before being sacked in November 2017. This was due to an issue involving one of the star players of the team. Fizdale was not unemployed for long as he was immediately snapped up by the New York Knicks who appointed him their head coach in May 2018. 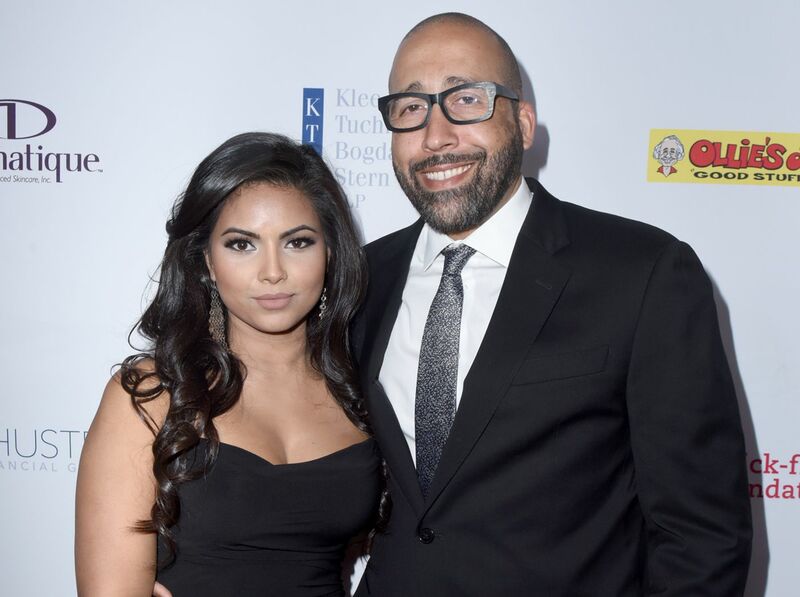 David Fizdale is very much off the market. He is married to the gorgeous Natasha Sen. She is 11 years younger than him as she was born on the 10th of June 1985. Furthermore, she is of Indian descent and has Canadian nationality. She grew up in Canada and attended the Ontario College of Art and Design University popularly known as OCAD University. She finished her studies in 2008 and has since worked as a creative director for some organizations but now has her own agency. Fizdale and his wife met during his stint as an assistant coach at San Diego. They got engaged in 2013 and tied the knot a year later, in August 2014. The Indian-style wedding ceremony took place at a luxurious hotel in San Diego. It had some high profile attendees including NBA star, Dwayne Wade, who previously played under Fizdale at Miami Heat. Fizdale and his wife do not have any children together at the moment. However, he has an adult son from a previous relationship named Kyle Jackson born in 1993. If there is one thing that is very important to the renowned coach, it is family. He credits his family with encouraging and nurturing his NBA dreams which seemed like a fantasy at some point but is now a reality. He grew up with his mom, Helen Hamilton and his two siblings, a brother, and a sister whose names are not available. Fizdale’s father was an absentee dad and he did not play a significant role in his life. It must be noted that Fizdale’s mom is African American while his dad was Caucasian. The father figure in Fizdale’s life was his maternal granddad, Robert Hamilton. He was a sanitation worker and church deacon and did all in his power to encourage his grandson’s ambition. Robert, unfortunately, passed away in 1994; the victim of a robbery gone wrong. In May 2018, David Fizdale signed a four-year contract that would keep him at the New York Knicks till 2022. The exact details of that contract are not available, however, he was previously scheduled to earn between $2 and $3.5 million per annum. There is no doubt that his current contract would be of equal value if not more. With regards to his net worth, Fizdale has reportedly amassed a fortune worth $20 million.